The Nigeria-based Liberian Association of Abuja (LAA) has called for a voting mechanism that will enable Liberians in the diaspora vote in the 2017 elections. The association, through its president Garrison Thomas, also called on the Liberian government to issue ECOWAS biometric passports to Liberians in Nigeria. The LAA made its calls during a meeting Tuesday with Liberian President Ellen Johnson Sirleaf’s while the latter was on a visit to Nigeria. The association also requested the issuance and renewal of ECOWAS biometric passports to Liberians resident in Nigeria in order to ease their travel and work permits. Liberians in Nigeria currently have to go back home to renew their passports. In response, President Sirleaf expressed her delight about the unity of Liberians in Nigeria. She promised to inform the National Elections Commission (NEC) about their request for diaspora voting. She also welcomed their application for ECOWAS biometric Ppssports, stressing the creation of a data base of Liberians in living outside of their homeland. Other prominent Liberians resident in Nigeria also spoke at the LAA’s meeting with President Sirleaf. ECOWAS Community Court of Justice Judge Micah Wright recommended to the President that absentee balloting would allow Liberians in the Diaspora to vote and strengthen the country’s democratic system. Minister of Foreign Affairs Marjon Kamara and Ambassador Dr. Al-Hassan Conteh also commented on the passport issue and other challenges experienced by Liberians in Nigeria. Liberian Foreign Minister Marjon Kamara assured the Liberians that her ministry is considering opening Passport Application Centers (PACs) for Liberians in strategic locations, including the United States, China and Nigeria, which could serve Liberians in adjoining states. 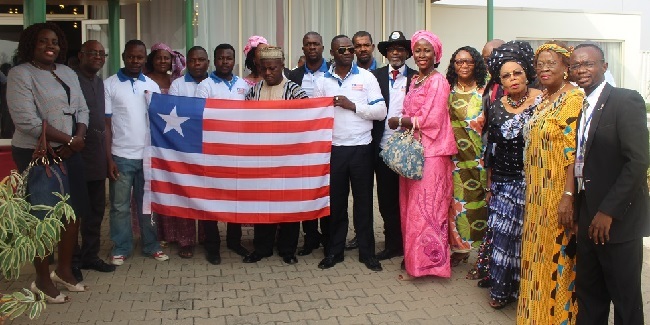 Liberia’s ambassador to Nigeria Dr. Al-Hassan Conteh said the embassy was awaiting approval of its proposal submitted last year for the opening of a Passport Application Center at the embassy.